The Katana lineup consists of three combo amplifiers and an amplifier head. The 50-watt Katana-50 and 100-watt Katana-100 come equipped with one custom 12-inch speaker, while the Katana-100/212 has 100 watts of power and two custom 12-inch speakers. The compact 100-watt Katana-Head is designed for use with an external speaker cabinet such as the 4×12 Waza amp cabinet. It also includes a very unique and convenient feature for an amp head—a built-in monitor speaker that works great for practice, checking tones, and even recording. Like the BOSS Waza amp and the Roland Blues Cube series, the Katana amps utilize the advanced Tube Logic approach to provide the expressive sound and response of tube-based amplifiers. In addition, the output sections of Katana amps employ a special method developed for the Waza amp that optimizes the interaction between the speaker and cabinet. This delivers authoritative punch and cutting stage presence previously attainable only with much more expensive amps. Each Katana amp features five selectable amp characters: Clean, Crunch, Lead, Brown, and Acoustic. Every character was fine-tuned by the BOSS engineering team to offer rock players a wide range of professional, gig-worthy sounds. A particular standout is the Brown character, which produces refined high-gain tones derived from the Waza amp head. The Acoustic character takes the Katana’s versatility even further, providing natural tone for acoustic-electric guitars and electric guitars equipped with piezo bridge saddles. That’s right—no need to take a second amp to the gig for playing acoustic tunes! The amps are equipped with familiar gain, bass, mid, and treble controls, making it easy to dial in tones quickly. All models except the Katana-50 also include a presence control. Amplifier and Equalizer sections on the Katana amp panel. 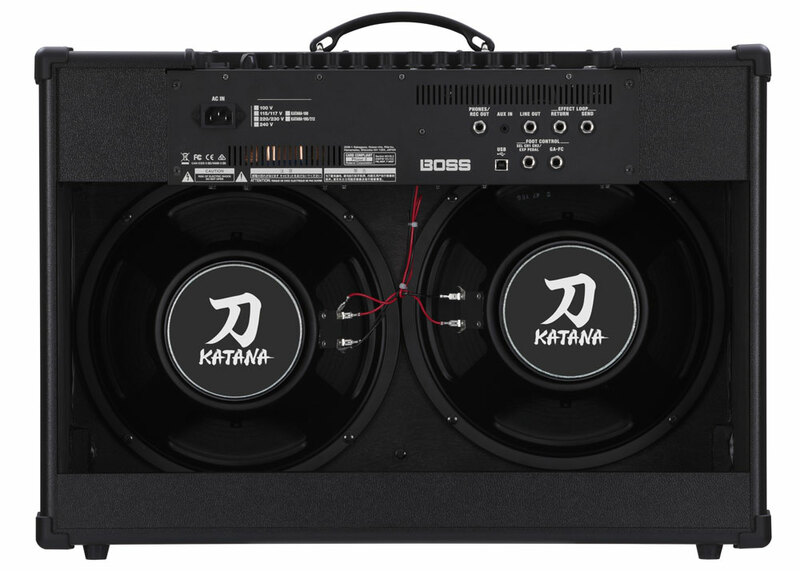 In addition to fantastic amp tones, the Katana series provides integrated access to 55 BOSS effects. You can load 15 different effects in an amp at one time, and use up to three at once. And with the intuitive interface, you’re able to select effects variations and adjust effects amount quickly and easily. For full customization, you’ll want to tap into the free BOSS Tone Studio editor. With this software, nearly every BOSS effect type is available to you—overdrives, distortions, delays, choruses, reverbs, and more. Even unique effects like Slicer, Slow Gear, Wave Synth, Ring Mod, and others are on hand! From your Mac or Windows computer, you can choose which effects you want to load into the Katana, and edit parameters on each to fully personalize your tones. The effects on a Katana amp are very easy to select and adjust. Pressing the buttons toggles between three different effects assignments for each knob. To check out a full list of the available effects and their parameters—and to explore all the other things you can do with a Katana amp and BOSS Tone Studio—check out the “Using BOSS Tone Studio for Katana” PDF document. The Katana amps feature Tone Setting memories that allow you to save custom sounds for instant recall while performing. Everything except the master volume setting is saved: amp type, gain, volume, EQ, and effects. The Katana-100, Katana-100/212, and Katana-Head have four Tone Setting memories, while the Katana-50 includes two. Each amp also has a Panel setting; pressing this button will cause the amp to reflect the current settings of all knobs on the panel. To save Tone Settings, just adjust the panel knobs the way you like, and then press and hold the desired Tone Setting button for one second. Master control sections of the Katana-100, Katana-100/212, and Katana-Head (left) and Katana-50 (right). Katana amps authentically recreate the complex output distortion characteristics of genuine tube amplifiers—as you turn up the volume, the sound gets richer and the feel becomes more dynamically responsive. With the Power Control function, you’re able to throttle back the overall volume volume while still retaining this inspiring cranked-amp sound. Settings include max output, half power, and a home-friendly option of 0.5 watts. The Power Control also includes a Standby setting that conveniently mutes the output for switching guitars and taking breaks. All Katana amps offer the ability to connect an external footswitch or expression pedal. This allows you to switch between Tone Settings 1 and 2, or to control the volume with your foot. The Katana-100, Katana-100/212, and Katana-Head also support the GA-FC Foot Controller. This provides foot access for Tone Settings 1-4, the Panel setting, switching effects groups on/off, tap tempo for delay effects, and effects loop on/off. Up to two expression pedals can be connected to the GA-FC as well. The Katana-Head is also equipped with a MIDI input for control in more advanced setups. BOSS Tone Studio lets you adjust, store, and recall numerous Katana parameters from your Mac or Windows computer via USB. As we touched on earlier, using the BOSS Tone Studio editor software takes your Katana amp experience much further. In addition to effects selection and parameter adjustment, it’s possible to adjust the order of the Booster/Mod and Delay/FX groups to place them before or after the Katana’s preamp section. The editor lets you dial in amp tones from the computer as well. After making adjustments, you can then save them to a Tone Setting memory in the amp. It’s also possible to save your custom Tone Settings as Livesets. This is great for backup, and also for organizing sounds for different gigs. 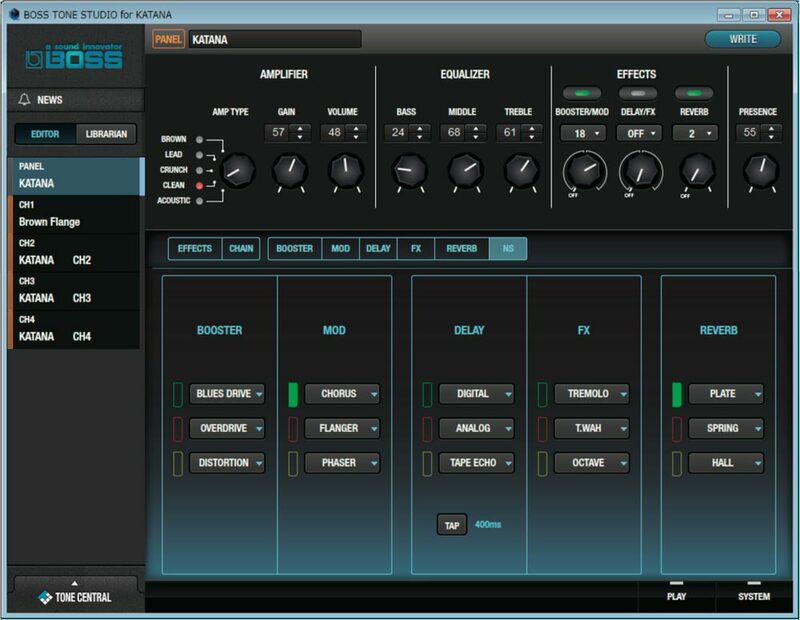 The BOSS Tone Studio editor for Katana is available for free at BOSS Tone Central. There, you’ll also find a growing collection of Katana patch collections created by pro players. 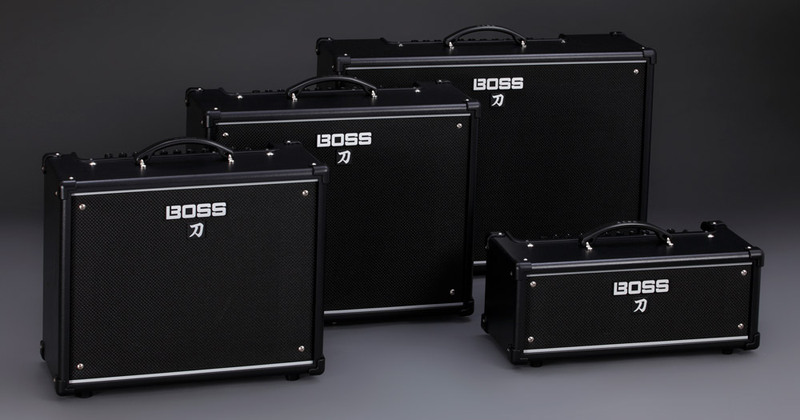 To learn more about the Katana amp series, visit BossUS.com.